The Reconciliation Pole when up on April 1. Photo by Andrea Smith. The University of British Columbia Reconciliation Pole is up. An estimated 2,000 gatherers tugged ropes in opposite directions April 1 to help lift a giant carved wooden pole up off the ground to an erect standing position. The pole was carved by artist James Hart, a hereditary chief and member of the Haida Nation. “It’s the result of a fairly long process between the donor, Michael Audain, and the artist, Jim Hart. 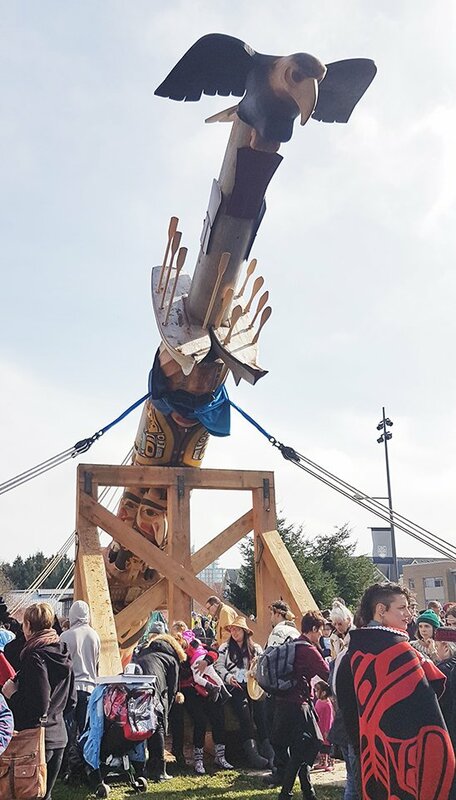 They settled on the idea of a pole that talks about the residential schools’ history and the hope for the future with those issues,” said Linc Kesler, UBC professor and director of the First Nations House of Learning. “The pole coincides with another major UBC project, which is the Indian Residential School History and Dialogue Center. Both projects will be on the Main Mall but on opposite ends of the campus,” he said, adding that the Center will be opened by summer this year. The pole is 55-feet in length, and was harvested from an 800-year-old red cedar tree growing in Haida Gwaii. Hart carved different sections into the pole, to reflect three different time periods. The bottom half is a salmon, bear and raven, to represent the time before the residential schools and the strong culture of Aboriginal people that existed then. There are also thousands of copper nails driven into the pole by family and friends of residential school survivors—each nail representing the children who died while attending the schools. A full ceremony with guest speakers took place before the pole was pulled into its standing position, and Hart was given a chance to speak about his thoughts behind his creation. “It’s about all of us… And that’s the meaning behind it… to help bring attention to what has gone on for all of us, and how we’re living through that and surviving,” Hart shared during his time on the podium. “And what amazes me as I’ve grown up through my life is to watch the transition of how rough it was in the earlier days in everyone’s younger life, to where they’re healthier, moving forward, and learning to deal with it in a positive way,” he said, giving hope for the future. Hart was accompanied on the podium by other guest speakers. Members of the Haida Nation, including other chiefs, were given the opportunity to share their perspectives and feelings on the day, as well as members of the Musqueam First Nation, to honor their unceded traditional territory, which the pole is now sitting on. UBC president, Santa Ono, also shared his thoughts, and Kesler was given a moment to speak openly as well. But possibly the most moving—and chilling—words, however, came directly from the residential survivors themselves. Barney Williams, a Nuu-chah-nulth Elder, and past member of the circle of Elders involved with the Truth and Reconciliation Commission, spoke from his own lived experiences. “I was ripped from the arms of my grandmother when I was six-years-old… And taken to a place that was foreign… that spoke a language I didn’t understand,” he said. “I’m 77-years-old now, and still when I hear footsteps in the hall, I get scared,” said Williams, adding that his road to recovery has been long, but in those moments, he at least now knows he is safe. The speeches were followed by a blessing of the pole, drum and dance circle, and then a barbeque of salmon to share as an offering to honorary members and privileged ceremony attendees. “The reality is of Indian residential schools for all First Nations is it indirectly or directly affects us in one way or another. And trying to work our way through that is difficult, but educating particularly non-Native people about that reality is a start, because it can build on empathy… not pity, but empathy,” said William Bedard, a crowd member who attended the ceremony. Bedard and his wife (who was also present with him at the ceremony) are members of the Haida Nation from Haida Gwaii; James Hart is their chief. Bedard has been a teacher in First Nations studies for nine years, and currently teaches at Windsor Secondary school in Vancouver. "I feel hopeful because it sparks conversation," he said about the pole. "It's going to be a symbolic thing in the middle of a place of learning... It's powerful."